Fig. 1. 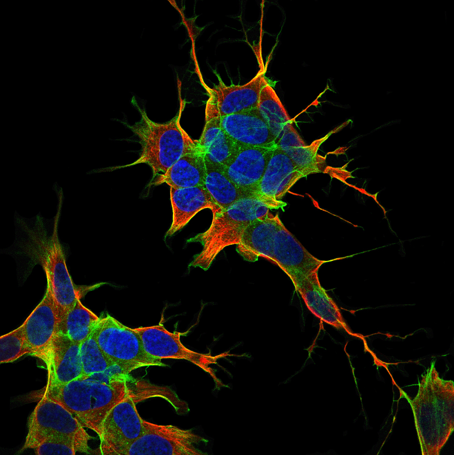 Immunofluorescence of SH-SY5Y neuroblastoma cells. Neurons are a remarkable aspect of living organisms that enable electrical signals to travel to the brain and back, this translates to voluntary and involuntary responses. Designing a functional system that could mimic the actions present in the brain has proved to be an obstacle for many researchers. The most tedious aspect of such a design is to model the learning mechanism so that external stimuli can be applied to find adaptive strategies. Dr. Silvia Caponi, a physicist at the Italian National Research Council in Rome, and her team created a bio-hybrid system that focuses on modeling neurons by utilizing memristors, electric components which are able to alter their conductivities based on previous electric history. A SH-SY5Y neuroblastoma cell line was grown in Modified Eagle’s medium (DMEM), which contained 10% (v/v) heat-inactivated bovine serum. Cells were grown on various substrates, such as silicon, glass coverslips, and synthetic polymer, PANI, covered coverslips. PANI was extracted utilizing a technique called Langmuir-Schaefer (LS). The cells were then plated at 104 cells/cm2 density for 24 hours in order to obtain the phenotype of a neuron. Then the medium was replaced and again substituted 5 days later to be immunostained. Several antibodies, such as anti-b Tubulin (Santa Cruz) were used at a concentration of 1:500. Cells were dropped over 3 ml petri dishes with or without PANI covered coverslips and split. Patch-clamp recordings and Raman spectra were carried out utilizing a solid-state laser with a wavelength emission of 532 nm. The spectra collected exhibited supramolecular components of living cells. Peaks of nucleic acids, proteins, and lipids were distinguished. Overall, this study discovered that PANI films are great support systems for cell differentiation. There was a reduction in the excitability of cells in response to positive stimulation, which could be due to adhesion factors. The capability to replicate cell-like models is a multidisciplinary accomplishment that could prove useful in several fields of study in the future. S. Caponi, et al., A multidisciplinary approach to study the functional properties of neuron-like cell models constituting a living bio-hybrid system: SH-SY5Y cells adhering to PANI substrate. AIP Advances 6, (2016). doi: 10.1063/1.4966587.